Xanthomas or xanthelasmas of the gastrointestinal (GI) tract are uncommon, benign, tumor-like lesions composed of collections of lipid-laden macrophages in the lamina propria., As it can histologically mimic malignant lesions; it is imperative to make an accurate diagnosis of this entity. A 68-year-old female presented with dyspeptic symptoms for the past 3 months not relieved on medications. Investigations revealed microcytic hypochromic anemia with hemoglobin 10.2 g%. Other investigations including lipid profile were within normal limits. An upper GI endoscopy revealed a normal esophagus and duodenum. But stomach showed small groups of whitish plaques on lesser curvature in body and antrum. Endoscopic biopsy from these gastric lesions was obtained. Histology showed preserved gastric foveolar epithelium but expanded gastric lamina propria by large rounded to polygonal cells with foamy vacuolated cytoplasm and central to eccentric bland uniform nuclei [Figure 1]a and [Figure 1]b. At places, these cells took a “signet ring”-like appearance. Subsequently, immunohistochemistry for cytokeratin and CD 68 to identify the epithelial or histiocytic origin of these cells was performed [Figure 1]c and [Figure 1]d. The foamy cells were PAS negative. The cells showed cytoplasmic positivity for CD68 and were negative for cytokeratin. 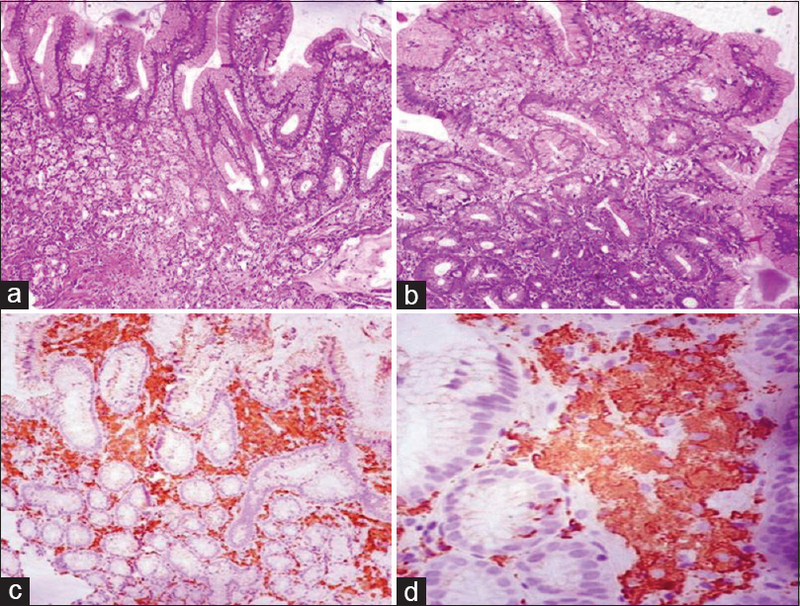 A diagnosis of gastric xanthoma was made on the basis of histology and immunohistochemistry. Gastric xanthoma was first described by Orth in 1887. The term xanthomatosis is used when there are diffuse and multiple lesions. Stomach is the most common site in the GI tract to be affected. Unlike the other non-GI sites, where xanthomas are almost always associated with hyperlipidemia, it is not so with gastric xanthomas. The etiology of gastric xanthomas is unclear and may be due to chronic irritation and prior gastric surgery. Endoscopically, these lesions appear as pale yellow or whitish nodules predominantly affecting the gastric antrum or pylorus as was in our case. Histology shows “xanthoma cells” or foamy histiocytes in the lamina propria of the mucosa. These cells are known to mimic various malignant lesions like signet cell adenocarcinoma. Other important differential diagnosis seems to be clear cell variant of gastric neuroendocrine tumors which may have similar vacuolated to clear cytoplasm. Special stains such as Periodic Acid–Schiff can be used to differentiate, as signet cell adenocarcinomas are positive due to mucin content. In addition, immunohistochemistry for cytokeratin will be negative in xanthomas as these foamy cells are essentially macrophages and will stain positive for CD68 confirming the histiocytic lineage. In our case, the lesion was gastric body and antrum in accordance to the literature and the cells were positive for CD68 confirming the diagnosis. Studies have also identified that gastric xanthomas can be associated with Helicobacter pylori infection, premalignant conditions such as atrophy, intestinal metaplasia, and even dysplasia or cancer. These associations make the identification and right diagnosis of gastric xanthomas mandatory and warrant adequate endoscopic evaluation., In our case, we did not identify any of these coexistent pathologies; however, we have advised a good follow-up. Andrejić BM, Božanić SV, Solajić NS, Djolai MA, Levakov AM. Xanthomas of the stomach: A report of two cases. Bosn J Basic Med Sci 2012;12:127-9. Basyigit S, Kefeli A, Asilturk Z, Sapmaz F, Aktas B. Gastric xanthoma: A review of the literature. Shiraz E Med J 2015;16. Gómez Z, Alonso A, William OR, Buitrago M. Gastric xanthoma is associated with malignant ad premalignant lesions. Rev Colomb Gastroenterol 2015;30:151-6. Khachaturian T, Dinning JP, Earnest DL. Gastric xanthelasma in a patient after partial gastrectomy. Am J Gastroenterol 1998;93:1588-9.